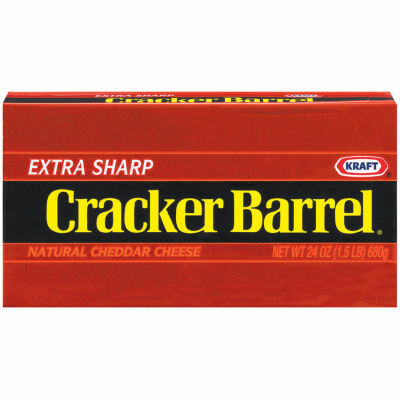 Cracker Barrel Extra Sharp Cheddar Cheese Chunk This Cracker Barrel Extra Sharp Cheddar Cheese Chunk is prepared with high quality ingredients that are healthy and delicious. A tempting blend of all natural extra sharp cheddar cheese, pasteurized milk and salt, this cheese has a flavorful taste the whole family will enjoy. A Dreamy and Creamy Addition to Your Meal - Popular with adults and children alike, this Cracker Barrel Extra Sharp Cheddar Cheese Chunk is a perfect finishing touch to a wide assortment of dishes. Try some with your favorite pasta dishes, pizzas, tacos, sandwiches or even on its own as a quick and satisfactory snack. Serving size 1 oz (28g - about a 1" cube).